Avp 2004 the last great Alien and Predator film. Topic: Avp 2004 the last great Alien and Predator film. In my opinion I think Avp is the last great Alien and Predator movies. The movie did a lot of unique things and it did its own thing. I very much love the movie and I think its underrated. Avpr, Predators, The Predator, Alien Covenant Prometheus, Alien Resurrection, all these films are bad in the general fans point of view. What do you guys think of Avp? Yes if it was R-rated that would of helped but for what it was, I think it was a very well done movie. Nah, Prometheus, Covenant would easily rate higher than AvP. Probably Predators and Resurection too. AvP is definitely "bad" in the "general fans point of view" as well. I'd argue it might be the last decent Predator movie, but Predators isn't that bad. I do like AVP (2004) But I also like Resurrection and Predators better. Definitely prefer Predators and Covenant to AvP. I think I'd rather watch it than Prometheus or Resurrection though. It just entertains me more. I rank AVP at number 4 on my Alien list. Alien, Alien 3, and Alien Covenant are better but AVP is a breath of fresh air from the usual monster in space formula. It's definitely the second best predator film, that's for sure. Predators cuts it pretty close though. Predator 2 is a much better predator movie that avp. The rest, as in AVP, Alien Resurrection, Alien Covenant, AVPR, all of them are just in a "meh" pile that I really can't recommend to anyone, but can find entertainment in depending on my mood. Personally, I would think Requiem would be even below a "meh" pile. Nah, except The Predator and Requiem the others are way better than AVP, maybe even Predators. I would've loved more aliens vs humans combat in AVP, an R-rated or 15/18 certificate and a lot more suspense. I digged the design of the Xenomorphs which took the best elements of ALIEN, ALIEN 3 despite some Resurrection trimmings of the neck design. Also add in that the PREDATOR Yautja featuring in an ALIEN movie did work yes it was the last best idea they had. But ultimately being a Paul W S Anderson film it was a 3/5 movie, moreso cause of the uneven tone in his movie making, whether technical or artistic. I doubt we'll get the cool practical effects of AVP, amalgamated dynamics did a fantastic job on the Xenomorphs imo, although their predators looked too rubbery. But ultimately no we haven't had that epic AVP3 yet, and after the, often rickerty, CGI effects of ALIEN-COVENANT I doubt we'll see a "weighty" AVP3 anyway. The AVP design is the Resurrection design. With minor arm/hand changes. By far the worst Alien design IMO. On closer inspection it is remarkable how similar they are. That said everytime a new "alien- film news" story comes up the promo shot for AVP-2004 always comes up. I think its the industrial brown lighting scheme of Resurrection that puts people off. with a blank background being readily available for the AVP design and not the original. Interestingly it's a far more suitable design for AR than AVP. 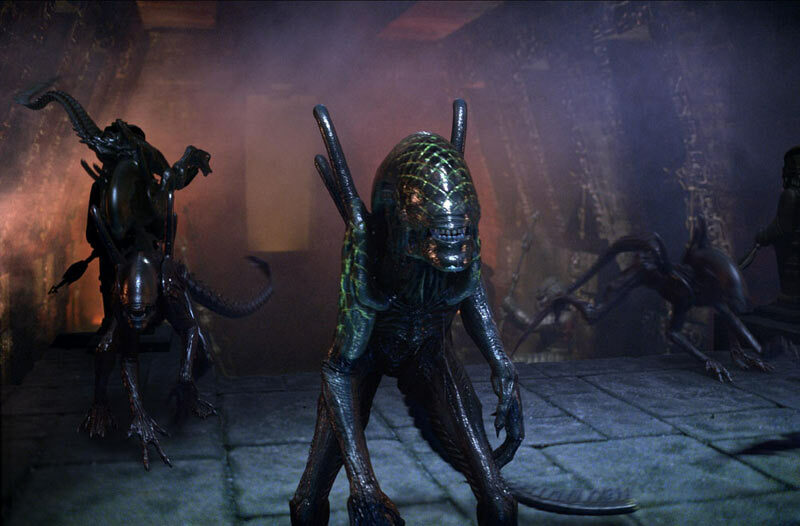 I might even treat AVP with less disdain if it featured good Alien and Predator designs. Yeah the alien designs in AR, AvP, and AvPR are the worst of the series.